Summary: This report displays the amount of earnings each employee has contributed to their 401K account per pay period and displays a total. Options The report has the following user options. Division Allows the user to choose to print the report for a specific division, or all divisions. Show 1st Grouping Totals? Allows the user to show the first grouping totals on the report. Show 2nd Grouping Totals? Allows the user to show the second grouping totals on the report. Show Details? Allows the user to show details on the report. If this option is not selected, no details will be shown. Show 1st Quarter? Allows the user to show the first quarter information on the report. Show 2nd Quarter? Allows the user to show the second quarter information on the report. Show 3rd Quarter? Allows the user to show the third quarter information on the report. Show 4th Quarter? Allows the user to show the fourth quarter information on the report. Date Allows the user to print the report for a specific date or specified date range. Employee Allows the user to select which employees are included in the report: all employees or only certain employees selected by the user. 1st Grouping Allows the user to select how the first grouping is grouped, by employee or pay item. 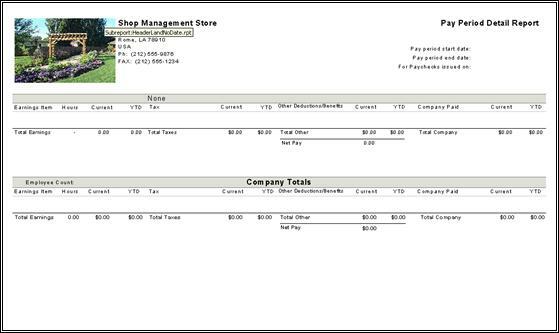 Pay Item Allows the user to select which items are included in the report: all or only items selected by the user. Current Range This field contains the employee's current hours and amounts for the date range. 1st Quarter This field contains the employee's hours and amounts for the 1st quarter. 2nd Quarter This field contains the employee's hours and amounts for the 2nd quarter. 3rd Quarter This field contains the employee's hours and amounts for the 3rd quarter. 4th Quarter This field contains the employee's hours and amounts for the 4th quarter. Summary: This report displays payroll information for each employee, such as address, hire date, and withholding amounts. Options : The report has the following user options. Show Active Employees? Allows the user to include active employees in the report. Show Inactive Employees? Allows the user to include inactive employees in the report. If this option is not selected, only active employees will be shown. Name/Position This field contains the employee's name and position. Social Security Number (SS#) This field contains the employee's social security number. Address This field contains the employee's address. Hire/Birth Date This field contains the employee's hire date and birth date. Active This field contains a yes if the employee is currently an active employee and a no if the employee is currently inactive. Pay Type This field contains the employee's pay type: salary, hourly, commission, etc. Pay Frequency This field contains the employee's pay frequency: weekly, bi-weekly, etc. Salary This field contains the employee's salary or pay rate. Standard Deductions/Amount This field lists the employee's standard deductions and the amount deducted. Additional Withholdings/Amount/Withholding Periods This field lists the employee's additional withholdings, the amount withheld, and the withholding periods. PTO/Days per Year/Balance This field lists the employee's paid time off days and lists the number of days left for use. Summary: This report displays paid time off amounts for each employee. Print One Employee per Page? Allows the user to print one employee per page. If this option is not selected, the report will be printed with several employees on each page. Name This field contains the employee's name. PTO Accrual This field lists the different PTO categories for the employee: vacation, sick, holiday, etc. Days per Year This field contains the number of days per year the employee has accrued for each different category. Balance This field contains the number of days available to the employee. YTD Hours Used This field contains the number of hours used YTD for the employee. Summary: This report displays a listing of employees from most senior to least senior. Sort By? Allows the user to sort the report by hire date, birth date, or name. Hire/Birth Date This field contains either the employee's hire date and birth date. Summary: This report displays details for a particular pay period. Options: The report has the following user options. Payroll Allows the user to select which payrolls are included in the report: all or only certain payrolls selected by the user. YTD Date Allows the user to select a YTD date. The user can select which date will be considered the end of the year date. It can be the current date or it can be a previous date. Total Earnings This field contains the total earnings for the employee. Total Taxes This field contains the total taxes taken from the employee. Total Other This field contains the total of all other deductions, such as 401K and child support. Total Company This field contains the company's total for the pay cycle. Net Pay This field contains the employee's net pay for the pay cycle. Summary: This report displays the quarterly Federal Tax Information for each employee. The report shows several things for each employee, including the employee's hours, YTD wages, and Income Tax amount. Employee This field contains the name of the employee. Social Security # This field contains the employee's social security number. Hours This field contains the number of hours the employee has worked. Before Pre-Tax Wages This field contains the amount of before pre-tax wages the employee has earned. After Pre-Tax Wages This field contains the amount of after pre-tax wages the employee has earned. YTD Wages This field contains the amount of wages earned YTD by the employee. Excess Over Max FUTA This field contains the amount of wages over the max FUTA amount that eh employee has earned. Income Tax Amount This field contains the amount of income taxes taken from the employee for the quarter. Social Security Amount This field contains the employee's social security deductions for the current pay period. Medicare Amount This field contains the employee's Medicare deductions for the current pay period. Summary: This report displays the quarterly State Income Tax Information for each employee. The report shows several things for each employee, including the employee's hours, YTD wages, and expenses over max SUTA. Excess Over Max SUTA This field contains the amount of wages over the max SUTA amount that eh employee has earned. Summary: This report displays the FUTA amounts for each employee. The report shows several things for each employee, including the employee's hours, pre-tax wages, and FUTA amount. Summary: This report displays the SUTA amounts for each employee. The report shows several things for each employee, including the employee's hours, pre-tax wages, and SUTA amount. Summary: This report displays tax tables. The Federal tax table will be showing on the report as well as the selected State tax table. Summary: This report displays information for each Worker's Comp code. For every code, all employees that are listed under that code will be shown. Each employee's hours as well as wages will be show. Show Details Allows the user to show details on the report. If this option is not selected, no details will be shown. 1st Grouping Allows the user to choose how the 1st grouping will be grouped. 2nd Grouping Allows the user to choose how the 2nd grouping will be grouped. Comp Code This field contains the name of the Worker's Comp code and the code number. Straight Time Hours This field contains the number of straight time hours the employee worked during the specified time period. Overtime Hours This field contains the number of overtime hours the employee worked during the specified time period. Straight Time Wages This field contains the amount in wages earned during straight time by the employee during the specified time period. Total Wages This field contains the total amount of wages earned by the employee. Wage Difference This field contains the difference between the employee's wages. Worker's Comp Total This field contains the totals for the employee for that particular worker's comp code. Summary: This report displays the yearly earnings and deductions for all employees. For the employee's earnings, the hours, YTD hours, amount and YTD amount will be shown. For the employee's deductions, the amount and YTD amount will be shown. Earnings This field lists the earnings the employee has earned, along with the hours worked, YTD hours worked, amount earned for working those hours, and YTD amount earned. Deductions This field lists the deductions the employee has had, along with the amount deducted for each deduction and the YTD amount deducted. Total Earnings This field contains the total earnings amount for the employee. Total Benefits This field contains the total amount of benefits received by the employee. Total Deductions This field contains the total amount of deductions deducted from the employee's pay. Total Net This field contains the net total for the employee. Summary: This report displays the yearly earnings and deductions for all employees. For the employee's earnings, the hours, YTD hours, amount and YTD amount will be shown. For the employee's deductions, the amount and YTD amount will be shown. This report is similar to the Yearly Payroll Recap Summary, but is more detailed. Summary: This report displays all the earnings, deductions, and accruals for each employee. Summary: This report displays all the information that must be printed on an employee's W2 at the end of the year. Employee Allows the user to select which employee's W2's are printed: all employees or only selected employees. A: Employee's Social Security Number This field contains the employee's social security number. B: Employee's Identification Number This field contains the employee's identification number. C: Employer's Name, Address, & Zip This field contains the employer's name, address, and zip code. D: Control Number This field contains the employee's control number. E: Employee First Name, Initial, Last Name, and Suffix This field contains the employee's first name, middle initial, last name, and suffix. F: Employee's Address and Zip Code This field contains the employee's address and zip code. 1: Wages, Tips, Other Compensations This field contains the amount of the employee's wage, tips, and other compensations. 2: Federal Income Tax Withheld This field contains the amount of federal income tax that was withheld from the employee. 3: Social Security Wages This field contains the amount of Social Security wages the employee earned. 4: Social Security Tax Withheld This field contains the amount of Social Security Tax that was withheld from the employee. 5: Medicare Wages + Tips This field contains the amount of Medicare wages and tips the employee earned. 6: Medicare Tax Withheld This field contains the amount of Medicare tax that was withheld from the employee. 7: Social Security Tips This field contains the amount of tips that Social Security was taken from. 8: Allocated Tips This field contains the amount of allocated tips the employee earned. 9: Advanced EIC Payments This field contains the amount of advanced EIC payments the employee had. 10: Dependent Care Benefits This field contains the amount of dependent care benefits the employee received, if applicable. 11: Non-Qualified Plans This field contains the amount of any non-qualified plans the employee had.